IMTRON, part of the GHM Group, has launched the Purely Analogue Signal Conditioning TSA modules that offer well-established methods for processing, filtering, amplifying and galvanically isolating sensor data in high quality. The modules can convert nearly any analog sensor signal into standard signals that can then be processed, for instance, in a control unit for data acquisition. In order to prevent damage to the system and guarantee high signal quality, inputs and outputs are galvanically isolated from each other and the supply voltage and signals are filtered. • Cost reduction – signal condition and galvanically isolating amplifier in one device, a separate isolator is unnecessary. • More signals – optional second output for integration into PLCs, displays and end devices for data acquisition. • High signal quality – flexible interference suppression with replaceable filter modules. • Velocity – limit frequencies of up to 30 kHz. • Precision – high precision and long-term stability. • Special requests – tailored solutions possible, even in small quantities. A selection of TSA modules comprising standard, two channel, special modules and TSA PWR special modules for actuation of servo valves are available. 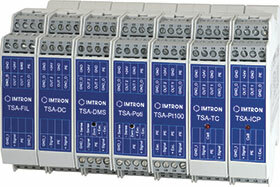 The modules are designed for a potential-free signal conversion and conditioning in automation and measuring technology. Each provides 3-way isolation with flexible interference suppression and plug-in filters, designed as Butterworth or Bessel filters of the fourth order. Other orders and filter characteristics can be implemented upon request. With potential isolation and filter characteristics, the modules are particularly well-suited for suppression of interfering influences in measuring and control circuits, for galvanic isolation of power and signal circuits, as well as for prevention of earth loops. The standard supply voltage is 24 VDC with a 12 V version also available as an option. The modules have plug-in connections for simple connection and the standard module width is 22,5 mm. Customer-specific adaptations e.g. measuring ranges, amplification factors, or sensor feed can be realised on request. The TSA modules are able to measure and record practically every measurable parameter regardless of whether it involves the monitoring of slowly changing variables, such as temperature, or rapidly changing signals, such as speed or vibration. All data is recorded with chronological synchronisation. IMTRON’s extensive expertise in signal conditioning is well recognised. The applications can apply to a test stand with several hundred channels or a laboratory measuring station with only a few channels. The company is also able to offer tailored solutions to meet specific customer requirements. Accurate residual measurement of oxygen critical for success of MAP.